What could be better than a book of 137 drama games? How about if they were incorporated into lesson plan format that can help you in a classroom? 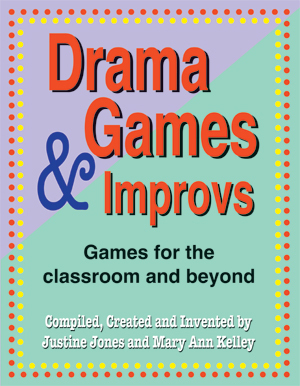 Now that drama games and improvisation are mainstream, this book develops a real drama curriculum using these techniques. Your students can learn about characterization, plot structure, ensemble acting, creativity, the art of listening and silence, and following directions... all while thinking they’re just playing games! Within the book’s 30 units are 74 lessons covering all elements of drama, structured sequentially with an emphasis on group building. Read more...You’ll love the clean layout that specifies demo, player prep, and performance minutes for every single game, as well as the number of players, equipment required, and skill level. Or, if you’d rather just have a book of educational and fun drama games, the well-organized charts in the back of the book allow you to quickly find just the right game to emphasize the skills you’re trying to strengthen while taking into consideration your group size and time constraints.